The Signal Collection exhibited a small and elegant system made up of the unique Davone Audio Ray loudspeakers ($7500/pair), jewel-like Absoluta Partenope integrated amplifier ($15,995), super skinny (just the way I like them) Black Cat Morpheus loudspeaker cables ($350/3m pair), and Stereolab Tombo interconnects and power cable (prices to be determined). MA Recordings Todd Garfinkle was selecting the tunes from his collection of wonderful SACDs and playing them through a Korg MR2000s digital recorder/playback unit ($2499). Kimber Kable’s Nate Mansfield greets everyone with a warm and friendly smile. 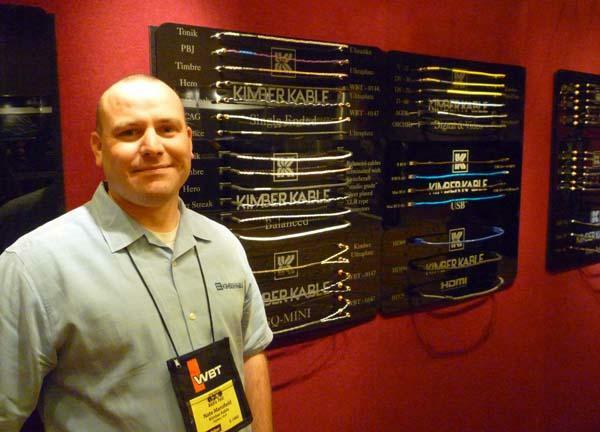 He was presenting Kimber’s entire line of speaker cables and interconnects, from the truly affordable Tonik (see Art Dudley’s review in our November issue) and the classic PBJ to the cost-no-object Kimber Select Series. I’ve never heard Kimber Kable in my own systema crime, I know. I’ll have to fix that sometime in 2012. 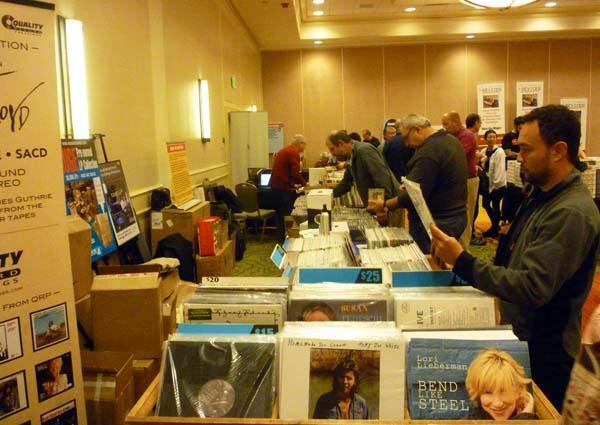 As we can tell from Michael Lavorgna’s awesome reporting over at AudioStream, computer audio was very hot indeed at RMAF, but there were still lots of old-fashioned vinyl enthusiasts to be found digging through the old-fashioned crates for old-fashioned music. 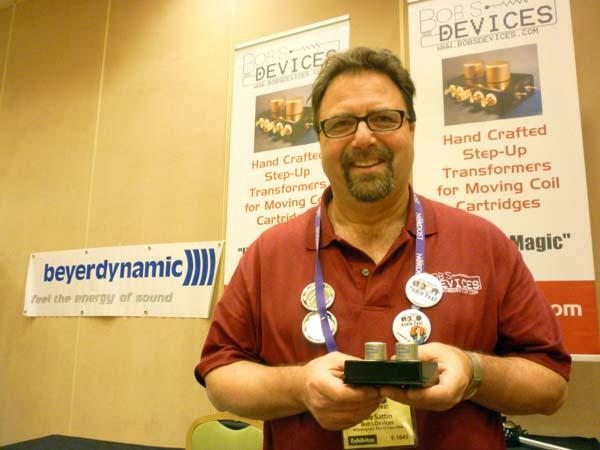 Bob’s Devices’ Bob Sattin was especially excited about his new CineMag 1131 (Blue) step-up transformer ($895). These transformers are especially developed for use with low-output moving-coil cartridges and represent the very best that CineMag has to offer. Hand-made and very limited. 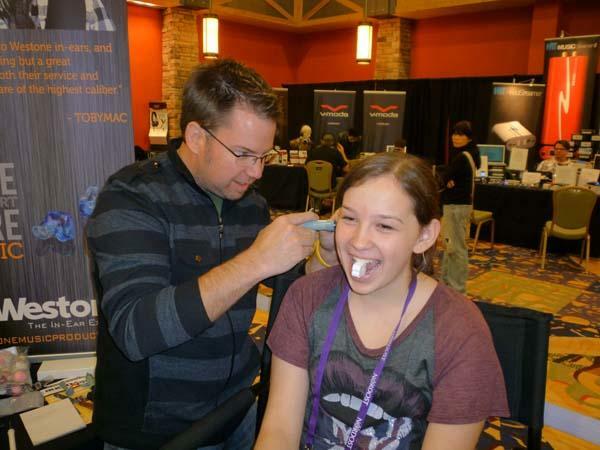 Emotiva’s Danielle Laufman had impressions made of her ear canals at the Westone booth. Both Danielle and her mom, Cathy, would be getting custom ear plugs, while Danielle’s father, Emotiva’s founder Dan Laufman, would be using his ear molds for custom in-ear monitors. 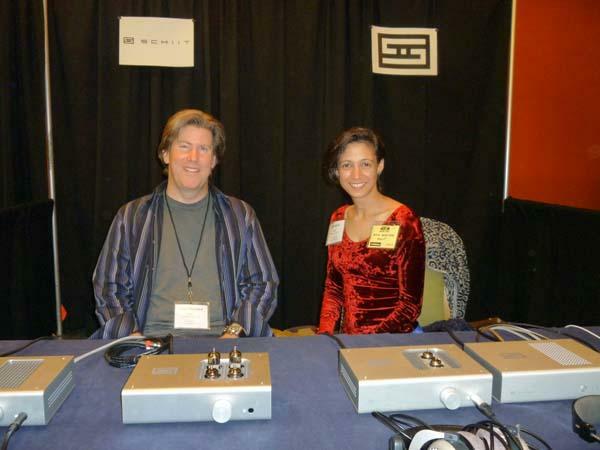 The JH Audio booth was always busy with eager listeners. Read John Atkinson's review of the company's top-of-the-line JH16 Pro. 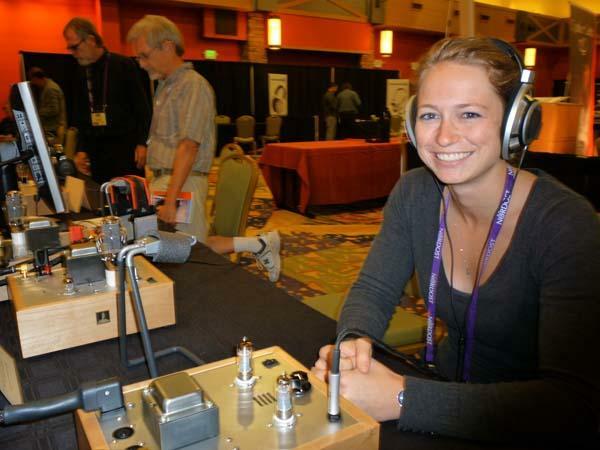 The Tape Project’s Piper Payne enjoys an iced coffee while listening to a Bottlehead headphone amplifier driving AKG K1000 ear speakersbe still, John Marks' beating heart!and receiving a massage from Bottlehead’s Dan Schmalle. The little card says it all, so I don’t have to. (Thank goodness.) 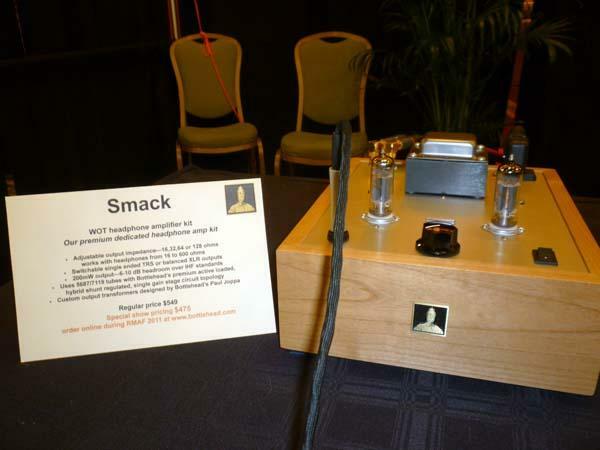 It’s the beautifully designed Bottlehead Smack WOT (with output transformers) headphone amplifier kit. The Tape Project’s Piper Payne is a talented mixing and mastering engineer and an active member of the Audio Engineering Society. (Be still, John Atkinson's beating heart!) She also enjoys origami, bunnies, the blues, and Bottlehead headphone amplifiers. I'm just kidding about the bunnies. 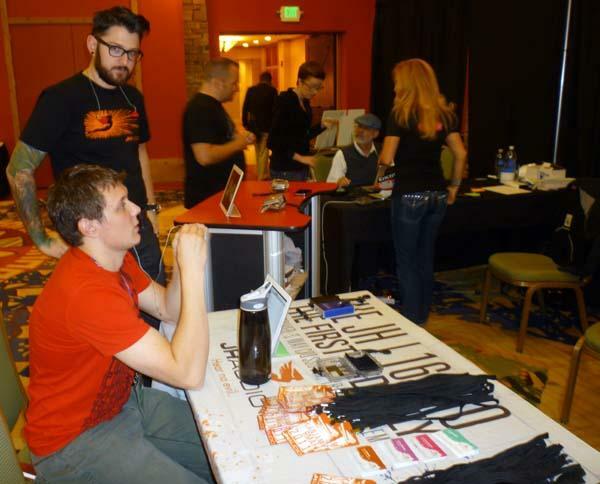 Jason Stoddard and Rina Slayter presented a row of Schiit headphone amplifiersAsgard ($249), Valhalla ($349), and Lyr ($449)along with the Bifrost DAC ($449, with “buzzword-friendly” asynchronous USB input; $349, without USB input). 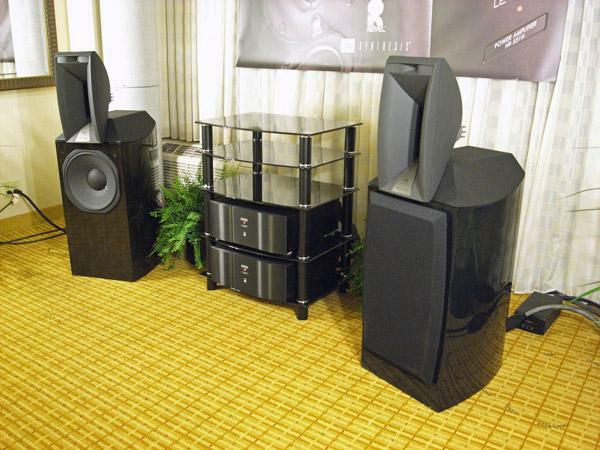 Larry Greenhill's May 2010 review of JBL's Synthesis 1400 Array BG loudspeaker was a highlight of that year's issues for me. At $11,500/pair, the 1400 Array offers a huge but highly neutral sound from its 15" woofer and horn-loaded midrange unit and tweeter. 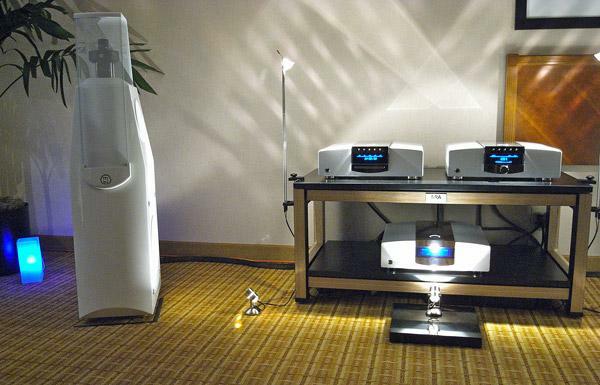 At RMAF, the JBLs were being driven by a Mark Levinson No.512 SACD player, No.326S preamplifier, and a pair of No.531H amplifiers, all hooked up with Transparent cables. 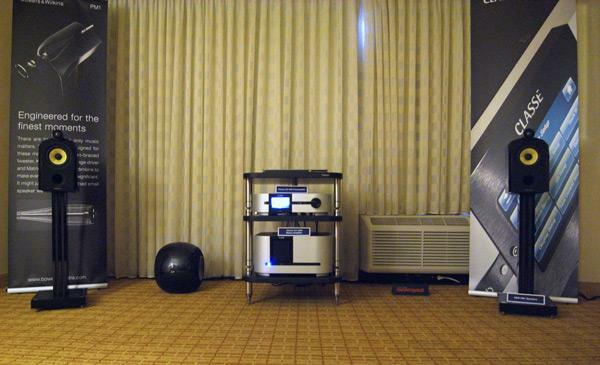 The room's acoustics had been tamed with ASC Tube Traps and the sound was as good as I was expecting. Danish manufacturer Vitus Audio was showing off its new RI-100 integrated amplifier ($13,000) at RMAF with a pair of YG Acoustics' two-way Carmel speakers, connecting everything with Purist Audio Design's Corvus-series cable. 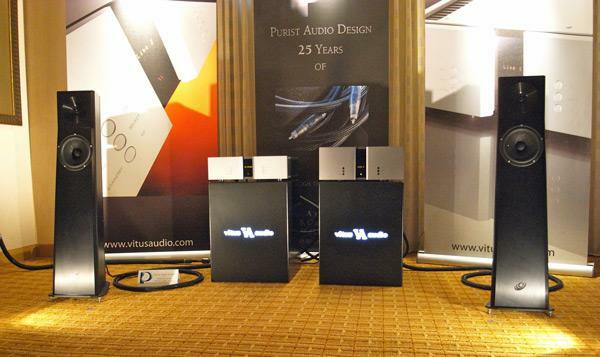 (Purist was celebrating its 25th anniversary at RMAF.) Running the 300Wpc amplifier's output stage in class-AB rather than class-A allows the RI-100 to be, for Vitus, relatively affordable. Swedish manufacturer Sjofn was luring visitors into its room with an attractive woman drawing their attention to a poster on the wall outside the door announcing (the clue). 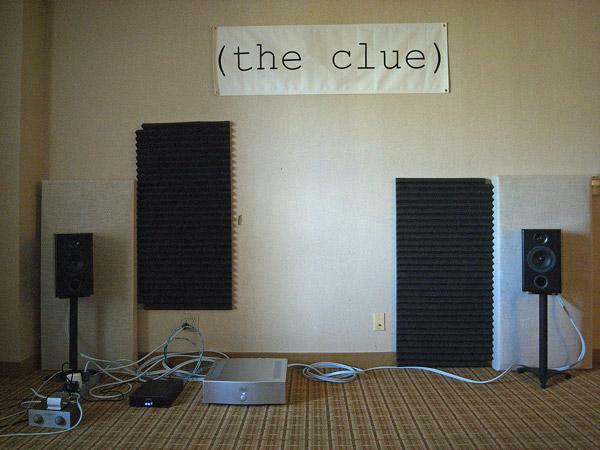 Inside the room was a pair of unprepossessing stand-mounted speakers, driven by a Hegel amplifier via Supra cables. The two-way, ported Sjofn speakers ($999/pair) were taking full advantage of their boundary loading to produce a big sound.